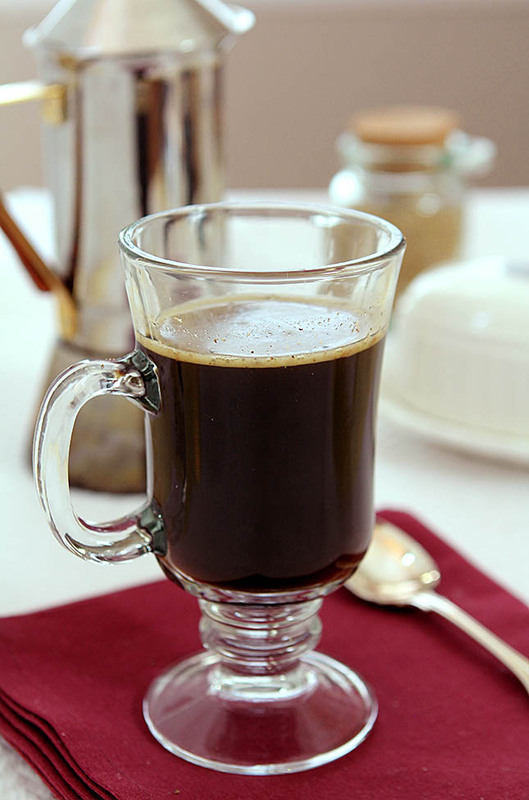 Have you heard about the craze over coffee with butter in it? It’s a new fad and you know I’m not all that keen on fads. But I was curious so did a bit of research and this is part of a diet? Really? Well son of a gun this warm cocktail kicks that fad to the curb; it also has sugar and booze in it. So while it might have some components of that nuttiness in the mix, put all together this is no diet drink! Truth is I would have liked some whipping cream but I didn’t have any and another truth is that whipping cream that has been over-whipped becomes what? Butter! So I decided to punt and booze up the bulletproof! The nutmeg might seem unnecessary but think again; it’s a nice subtle touch that elevates the experience and it’s great with coffee. 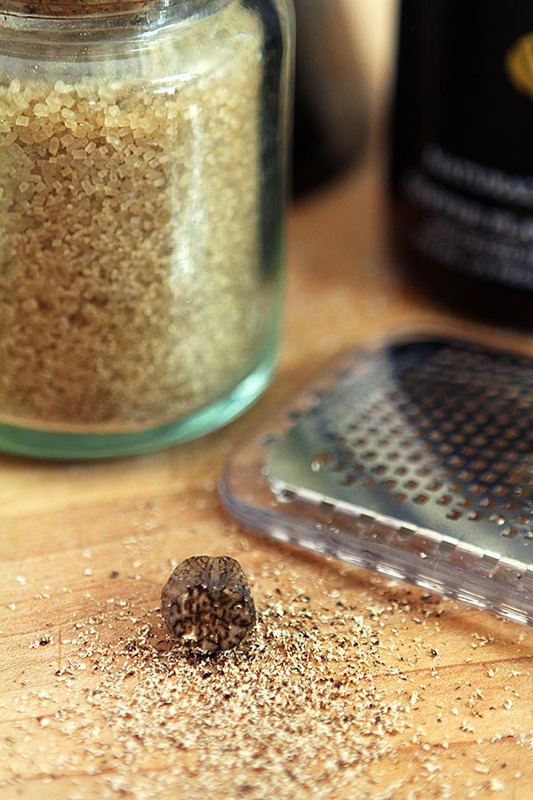 If you’ve never tried fresh nutmeg that you grate yourself, you’re missing something special. An aroma I love sure, but once you get inside, it is an unusual and beautiful seed. I also discovered that while people with tree nut allergies must avoid the fruits of a nut tree, they can often still enjoy the seeds; so someone allergic to almonds, pecans and walnuts might still be able to enjoy the aromatic qualities of the nutmeg seed. Ah the things I learn while I’m making cocktails! Another truth? I’m not typically big on flavored vodkas. I prefer using 100 proof vodka to make my own infused concoctions. Still, I’ve been asked a couple of times by the folks at Van Gogh Vodka to sample some of their products and I’ve never been disappointed; they are the only flavored vodkas I’ve got in my bar. Van Gogh Vodka is produced by the Royal Dirkzwager Distilleries (which received a Royal Appointment from Queen Beatrix in 2005) at the Cooymans Distillery in Tilburg, The Netherlands. Second-generation Master Distiller Tim Vos handcrafts the vodka through a proprietary double-infusion method, using the finest ingredients combined with premium grain alcohol to create Van Gogh’s bold flavors and smooth taste. I have yet to see them come up with variations like marshmallow or cake either; flavors that seemed marketed to kids. Their natural flavors shine and this Double Espresso Vodka has a great roasted aroma with a touch of sweetness that is nicely balanced by a hint of bitterness that rivals a cup of espresso and helps to keep the spirit balanced. I love it for both cocktails and as an addition to one of my favorite chocolate sauces. While many might see this as a late night after dinner drink, I enjoyed it earlier in the evening. The butter brings a richness but much less so than big dollops of whipped cream and the espresso was a nice pick me up without keeping me awake later that night. Warm, a little sweet and just that touch of richness? Crazy good. In a coffee mug or toddy glass, combine all ingredients. Stir to incorporate the butter and garnish with freshly grated nutmeg. I was provided with a sample bottle of Van Gogh Double Espresso Vodka however all commentary is my own. I LOVE Van Gogh espresso vodka, but I can’t always find it! Even in the largest store near me they don’t have a lot; it’s my favorite so of course it’s hard to find! I have not heard of coffee with butter in it. But I’m intrigued. And of course if you add vodka into the mix (my 2nd favorite alcohol) I’m all in! BTW, where can I get Van Gogh Vodka? I want to try it! I’ve seen it at a couple of larger stores here; maybe just check with a local retailer? I think it’s got a decent distribution in the states. If I give it a go, I’ll certainly let you know what I think of this recipe! I was too and actually a bit suspicious…but I took the leap and it was good. There might have been some tongue in cheek involved but I really did enjoy it. I think more important than the butter even is the nutmeg! Hi Barb – do you know where this adding butter to coffee fad came from? Ethiopia. Yup, coffee is a bid deal in Ethiopia and there is an actual ceremony involving the preparation and serving of coffee – which often includes a bit of butter added to the coffee!!! Amazing what you learn teaching a class on cultural foods!!! Nope, not heard of adding butter to coffee. I’ll take mine black, thank you very much. Butter in cocktails, though — well, there’s a long history of adding it to things like hot buttered rum. Love that! So I’ll bet I’d love this too. Very creative — thanks. A drink with only one numbered instruction in the “how to” list is for me. Even I could make this one, thanks! 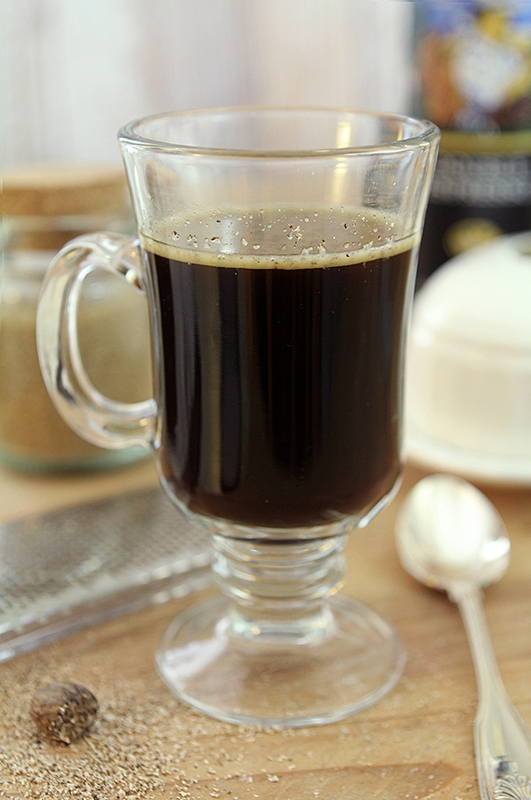 Leave it to you to add booze to bulletproof coffee. 🙂 I haven’t tried this fad, but am admittedly intrigued. Also, that vodka? Sounds heavenly. Oh my, such a great color, and I imagine flavor. Just need the fireplace now.